A visit to Graham and Sarah Riddick's lovely home and garden in the Weald this afternoon finished a heavy weekend of Conservative Party events (five in total). 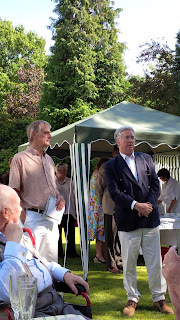 Today was the annual Garden Party for Gold Members and members of the Patrons' Club. 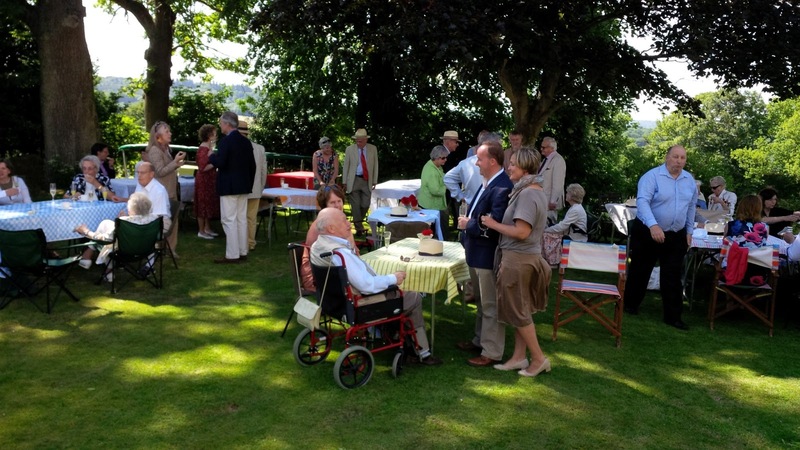 The event brought together members from the three Associations I work for (Tunbridge Wells, Tonbridge & Malling and Chatham & Aylesford) with each of the Associations taking a turn to host this annual event. 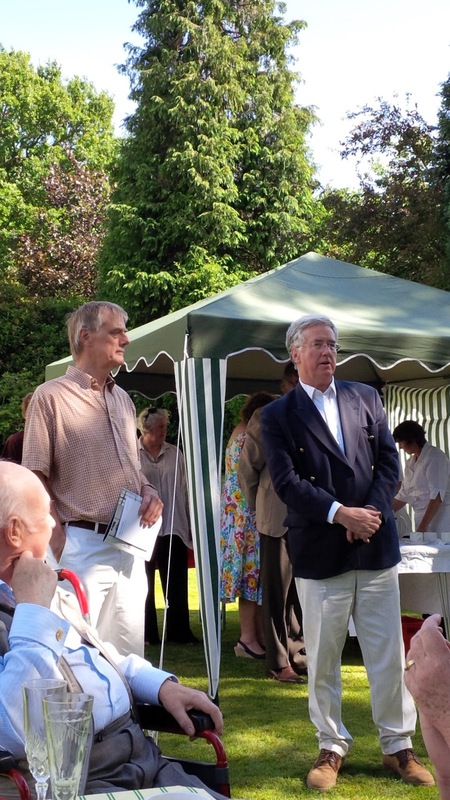 The guest speaker today was Michael Fallon MP, Minister of State for Energy and MP for Sevenoaks. I told Michael that back in 1983, when I was just 17, I went to Darlington to help at a parliamentary by-election where he was the candidate. He lost by 2,000 votes before winning the seat three months later at the General Election. The personal highlight of the day was towards the end, as the guests were leaving, a longstanding member who is an outstanding fundraiser came over to say that she had been so inspired by my presentation at yesterday's "Road to 2014" conference, that she had decide to join us canvassing, and that it was the first time she had ever agreed to do so in over 30 years active membership. Locally we have three levels of membership. We then have Gold Membership at £60.00, which includes an invitation to the annual Champagne Afternoon Tea. Finally we have the Patrons' Club at £200.00 ,which includes the Champagne Afternoon Tea and also an autumn dinner at a prestigious London venue with a top rank guest speaker. This year we shall welcome Rt Hon Michael Gove MP at the Athenaeum Club. Planning for the fight ahead! 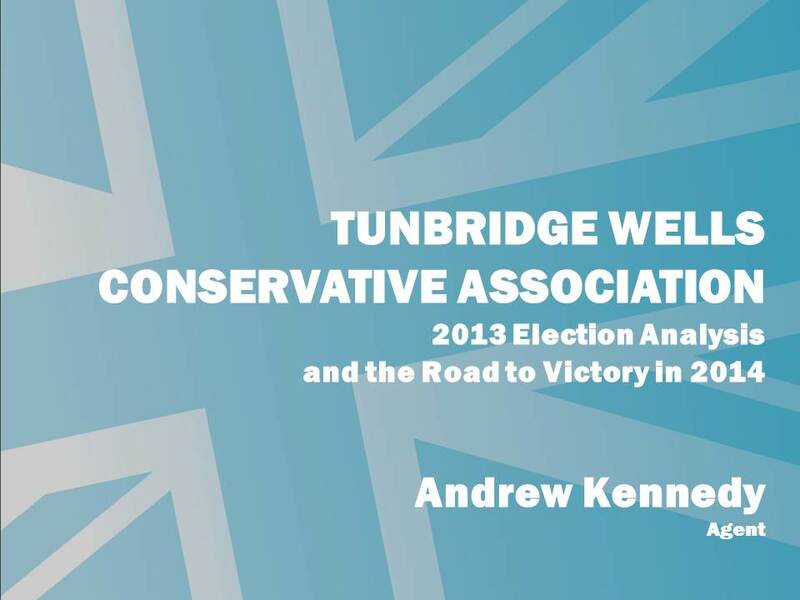 Today, with a new team of Association Officers chomping at the bit, and our sights firmly set on next year, we convened a special conference "The Road to Victory in 2014" attended by over 50 of the Association's councillors, prospective candidates and key campaigners. Having spent much of the past month tarting myself around Carshalton, Rochester and Seaford, it was good to be back on home turf! First up was new Association Chairman, William Rutherford, who confirmed that the trustees had sold the freehold of the Association's former HQ, the upkeep, maintenance and Business Rates on which had for so many years been a drain on resources. This was met by a rousing cheer from the members, who can now look forward to a new, fit for purpose HQ within the constituency, which will hopefully become the base for the continued shared Campaign Resource Centre which has worked so well over the last two years. Next was the Associations Deputy Chairman (Political) Nicholas Rogers. who set-out details of the timetable to select our 2014 local candidates along with details of a West Kent-wide campaign to identify and recru8it potential new candidates from the community. Nick is a fantastic campaigner who, despite working full time and serving his community as a councillor, he never forgets the importance of campaigning, and the fact that without it we will fail to win elections. I followed on from Nicholas with a presentation on our strengths and weaknesses, and the lessons we need to learn from 2013 to ensure we retain all of the seats we are defending next year. Obviously I am not going to publish on this blog details of our research or strategy, other than to say it is my intention that we not only will we retain every seat which we are defending, but we also intend to gain two of the three seats the Lib Dems won in 2010. 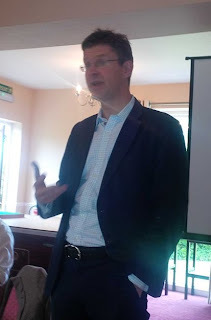 Finally, our outstanding MP, Greg Clark, addressed the meeting. Greg had cleared his diary to spend the entire morning with us, which considering his many responsibilities as a constituency MP and Government Minister was warmly appreciated. Greg spoke with clarity and vision about the present political situation, and the choices ahead for the country. It was a good morning. Good to see so many people prepared to give up a lovely sunny Saturday morning to participate in political discussion and debate. Our members were positive, progressive and clearly up for the fight ahead. Bring it on! News has just reached me of a parliamentary hopeful who has applied for selection for a marginal constituency somewhere north of Kent. Association Officers and others with local influence were all lucky recipients of a complimentary copy of his latest book which, by amazing coincidence, landed on their doormats at exactly the same time as nominations closed and the applicants CVs were emailed for the sift. Unfortunately, in his obvious haste to get his books into the hands of those who will judge his abilities, he didn't place sufficient stamps on each envelope, resulting in a queue of angry Tory big wigs being surcharged £1.20 each (plus the buggeration of a trip to the local Royal Mail office to collect their *free* gift) . From what I hear he might well be invited for an interview so they can all demand their money back! 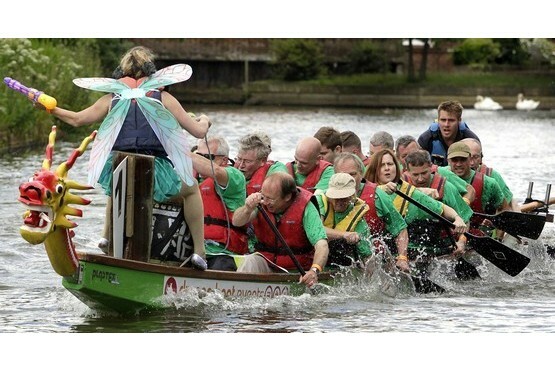 The Tonbridge and Malling team paddle like fury in the Dragon Boat heats at the "Taste of Tonbridge" Day last Sunday. Front is Cllr Howard Rogers (Mayor of the Borough). 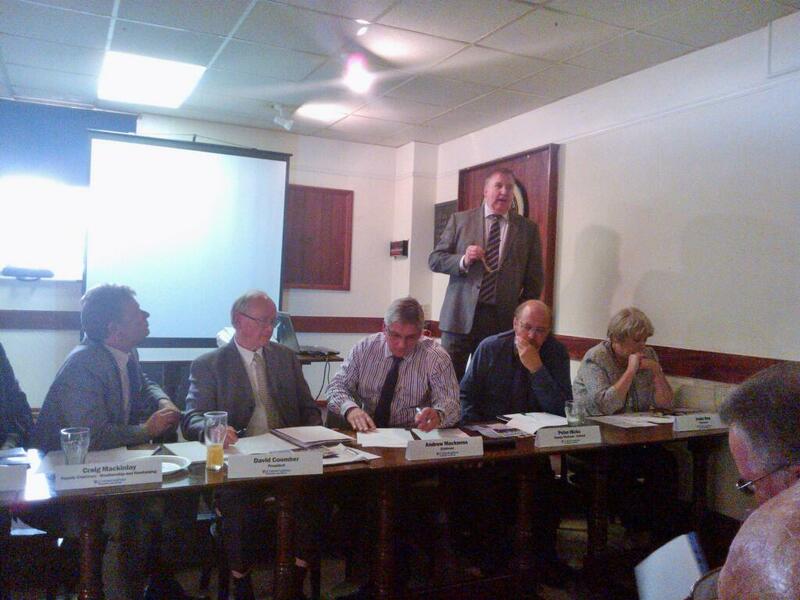 Three behind Howard is Cllr Sarah Spence, directly behind Sarah is Council Leader, Nicolas Heslop. Diagonally behind Howard it looks like Cllr Matthew Balfour, gasping for breath (and a drink, by his pained expression). I can strongly deny that the fairy at the front with large water pistol, wings and silver satin slippers, is the constituency agent. I had an informative and useful meeting today with Julie Isles, Southern Regional Organiser of the Conservative Women's Organisation. I have blogged previously on how I support gender and age-specific groups. If having such organisations encourages people to get involved in politics I can see no reason, as a Libertarian, to oppose their formation. That does not mean, however, that I support positive discrimination; and I was pleased that Julie shared my view on this. Women are just as capable as men and are entirely able to hold their own in any equal contest. But that is the problem, too often in politics the playing field isn't level. Overall only 23% of MPs are women. Of Conservative MPs the figure is 16%. Liberal Democrats have 14%, and Labour, despite a decade of positive discrimination and women-only shortlists, can still only boast 31% female MPs. Clearly, we all have a long way to go, and not just in politics. Similar gender imbalances can be found in business, commerce, law and medicine too. My political life has been dominated by strong and confident women. My first MP was Lynda Chalker (now Baroness Chalker) in Wallasey who was an outstanding Minister for Transport and then Deputy Foreign Secretary. And now I have the equally formidable Tracey Crouch in Chatham & Aylesford. Neither were elected because they were women; they were elected because they were the best applicants and as a consequence they never had to justify their positions. However, before we have real equality we need to remove the barriers which prevent certain people from entering the contest. If only 20% of the applicants are women it is hardly surprising that only 20% of those elected will be women. Similar imbalances exist in the fields of sexuality, ethnicity and geography and we must address and tackle those inequalities too. However, rather than placing unfair barriers in the way of talented men, we need to eliminate the reasons why certain people don't join or progress as far as they could. And that is what Julie Isles and her colleagues in the CWO are trying to achieve. By providing training, mentoring, development and support they are doing outstanding work in attracting women from all backgrounds into elected office. And they are also ensuring that the voices of women are heard in what is still a male dominated environment. Working towards equality of opportunity is exactly what a modern, egalitarian and progressive Conservative Party should be doing. I look forward to working with Julie and her colleagues to extend the benefits that membership offers and the opportunities we provide for all sections of society. "Derek reported that the Women's Institute had refused to cook the annual Christmas Lunch and therefore other opportunities needed to be explored. 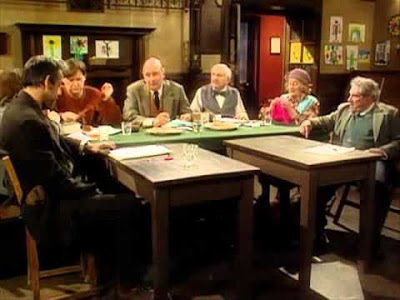 George said the village pub were keen to accommodate us, but some were concerned that the popular music was played too loudly, which may prevent deaf members from participating in the conversation. It was agreed to form a sub committee to investigate other options, including another approach to the womenfolk, to see if their minds might be changed." I wish them well ! NB: It's just been pointed out to me that the above report was not in the Parish Minutes, but a report submitted by the secretary of one of the village "Community Groups". Happy to make the correction! Earlier this evening I was waiting at the checkout at Tesco having bought a few bits and pieces for dinner. A late middle-aged couple waiting at the adjoining till were clearly looking in my direction. I had no idea who they were and paid very little notice, until I heard the man say to the woman with him, "there's that Tory bloke..."
I racked my brains trying to remember who they were or when I met them. I like to think I have a good memory, but in this case I drew a complete blank. Given the thousands of doors I have knocked on over the years, that is hardly surprising, but they clearly knew or remembered me. I sensed it was best not to respond; his tone wasn't aggressive but nor was it friendly, and I suspected an acknowledgement would have probably made matters worse. I avoided the temptation to challenge him as I was now convinced that he was looking for an argument. At no time did I feel threatened, nor was I particularly upset at being verbally abused; having cut my political teeth in Merseyside in the days of Derek Hatton and Militant Tendency, this was mild! What really surprised me though was being recognised by complete strangers, who then felt it was acceptable to behave in this way. This provided me with a brief insight into what it must be like being a Member of Parliament, who must face this ten times a day, regardless of whether they are walking through town, doing their weekly shop or socialising with friends. It must be hell, though one of the MPs I work for was honest to admit, "It would be much worse if no-one recognised me. Perhaps I should shop in Waitrose! Amused to see my blog featured in the Sunday Times. I can assure Mr White that the only version of the Red Flag I know could not be performed in mixed company! 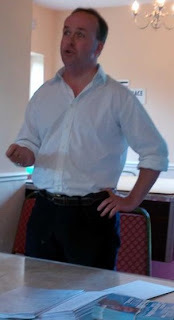 I was singing for my supper again tonight, this time at the Rochester and Strood Conservative Association Executive Meeting, where the new Association Chairman, Andrew Mackness, invited me to recite my mantra of "more leaflets = more votes." Rochester and Strood is a super Association; 300 members, active branches in all but one ward, financially secure and ably led by a young and professional Management Committee. I was somewhat taken aback when entering the room to see people standing at the back; there must have been 60+ members there. I mentioned the turnout to their Organising Secretary, Chris Buckwell, who said, "yes, sorry - 6 or so have sent apologies - there are normally more." The Association also provided a complimentary buffet, a nice touch given many attended directly from work and probably would not get home until 10pm. 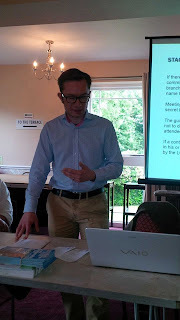 I was particularly impressed that as part of the development of the Association's draft business plan, which is submitted to Kent Area, each branch was also asked to draw-up their own strategy plan, which was incorporated into the Association's goals and objectives. I wonder if any other Associations ask their branches to do this? Mine don't, but perhaps we should. All things considered, a very enjoyable evening. It is wonderful to see a thriving, politically active and successful Association. Jason Allen, our super local printer, called today to tell me, "I am about to start work on Tracey Crouch's back side, would you like to pop in on your way to the office and watch." The back side in question was the reverse of her latest leaflet, and I must say that it was gratifying to see something you have worked on (and will no doubt soon be delivering through thousands of letterboxes) rolling off the press. My thanks to all who work hard behind the scenes getting such good quality material designed and printed. Especially Stephen Ion at CCHQ for his excellent work on design, Caroline Spensley who is our local graphic designer and who keeps calm and professional when I request yet more copy changes, and to all at DA Printers Ltd in Rochester who are not only great supporters of the local Associations, but always deliver on time and within budget. A new approach to Policy Discussion? I have never been able to get very enthusiastic about Policy Discussion Groups, whatever guise they take. I remember them back in the 1980's - I think they were called the Conservative Policy Centre (CPC) then. Turgid briefs came in the post each month from 32 Smith Square and Associations were invited to discuss the issues and provide answers to various set questions, which were duly typed-up in great detail and then studiously ignored unless they chimed with party policy! Back then (I am sure it's different now) the attendees at such discussions were all of a type - the type you would hide from in a supermarket in case they engaged you in conversation! You know them - they carry various press cuttings in their wallet, which they can produce to add weight to their well rehearsed theories on the knock-on effects to British tin mining following the devaluation of the Ecuadorian Quito. Now I must, at this point, say that policy and political discussion are for many the reason they join a political party. And I am all for it; provided talking about it never replaces actually doing something positive to help us win the election. Sadly, for too many, talking about it is their raison d'être. Two years ago we were fighting a critical council by-election. Polling day was the same night as the monthly meeting of that Association's Policy Group - so I suggested to the organiser that it might be cancelled or at least put back to 9pm, so the members could come out and knock on a few doors and help us win. My request was declined on the basis that moving the date or time might cause confusion. So whilst eight of us where slogging the cold, dark November streets desperately working to retain a marginal seat, 15 others were sitting in the warmth, talking about House of Lords reform. We did hold the seat, but I have found it quite difficult to either forgive or forget. I am therefore in an unusual position to find myself actually feeling enthusiastic about changes the TW Deputy Chairman Political, Nicholas Rogers, is proposing to make to the local Policy Discussion Forum. His plans include moving the meetings to various locations around the constituency thus making access easier and encouraging new people to attend, inviting an interesting and relevant guest speaker to lead the discussion, not necessarily an MP - perhaps a local councillor, voluntary sector or charity manager or someone with direct experience of the policy area being discussed and inviting local pledges and opinion formers in the village or ward to attend and participate (thus hearing the views of our local supporters and community leaders, not just the party faithful). All of this is music to my ears - reaching out beyond the narrow confines of our base, encouraging others and extending our reach into local communities by involving them in our work. Well done to Nicholas Rogers for a radical and original approach. I have previously blogged about my collection of political memorabilia, in particular my collection of rare photographs of British Prime Ministers, particularly Margaret Thatcher. I always keep my eye on Ebay and other dealers' sites, though I am now very selective. There are a lot of fakes around, and much of what is genuine is of poor quality. 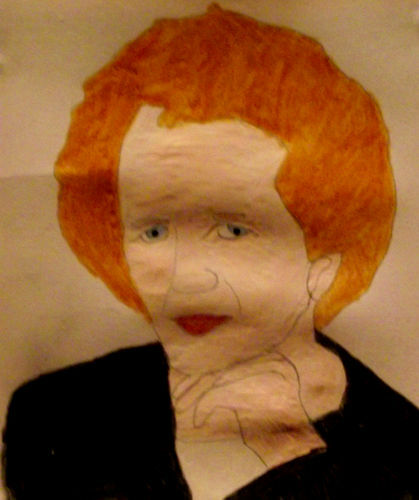 Imagine my excitement then when I spotted on Ebay a lot entitled "Hand painted portrait of Baroness Thatcher, signed by artist." I nervously clicked on the link, hoping that I would not like the picture as we are saving money to buy our new boat next year. I wasn't disappointed. Having reviewed the price and quality, and discussed it with Steve, I decide not to join the bidding. I do, however, wish the seller every success. At the time of posting this, the highest bid is £3.00. Hurry, or you might miss an investment opportunity of a lifetime. Almost a year ago I blogged in favour of the concept of Police and Crime Commissioners. My 22 July blog post NO TAXATION WITHOUT REPRESENTATION set out what I considered to be the case for change. I believed then, and still do, that the person who is politically accountable for the actions and expenditure of a police authority should be directly accountable to those whose taxes pay for those services. It is no secret that I ran Craig Mackinlay's unsuccessful campaign as Conservative candidate for Kent Police & Crime Commissioner. It was a hard campaign and a bruising experience for all of us involved. I have been an apparatchik long enough to take the blows, and providing laws aren't broken, I seldom complain about opposition tactics. We made some mistakes, especially by allowing those around Mrs Barnes to set the terms of the narrative. In our defence, this happened long before Craig Mackinlay was selected. However, from day one we were on the back foot as Mrs Barnes' well funded campaign grabbed headlines with accusations that we were politicising the police. The irony that Mrs Barnes' only consistent campaign message was being crafted and spun by her Liberal Democrat campaign manager who had three times stood for parliament, seemed to be overlooked by both voters and the media. As the campaign progressed I tried to get the local media to focus on her record and question her independence. Most journalists I briefed admitted that they too thought she was a Lib Dem, or at least backed by them (there was no Lib Dem candidate). However, as one told me, "she's the only candidate who can give you guys a run for your money - so we are giving her an easy ride to try and spice-up the contest." Obviously I couldn't brief that I thought we were going to lose as this would have been reported as "Tories face defeat in November poll". It was therefore little consolation when at Dover Guildhall, where the votes were being tallied, when the same journalist said to me, "if we knew she was going to win we would have asked more difficult questions." Indeed. So, six months later, how has she done? Well, her first act was to appoint her Lib Dem campaign manager (Peter Carroll) and his business associate (Howard Cox) who also worked on her campaign, as her paid advisors on six month contracts. These were part time roles with taxpayer-fund salaries of £6,000 per month each. (Annually this equates to £72,000 each - more than three times the salary of a police constable). Then we had the absolute debacle over the appointment of a Youth Police Commissioner, which not only damaged Mrs Barnes' personal credibility but also turned her entire operation into a national laughing-stock. See HERE. And now it is reported that the two personal advisors who allowed her to get into this mess have both been re-appointed on the same £6,000 per month salaries (each!) for a further six months. "It's no secret that the Kent Police Authority members oppose directly elected commissioners, we see them as unnecessary. They will have no different or additional powers than the current police authorities, and are a wilful waste of public money." 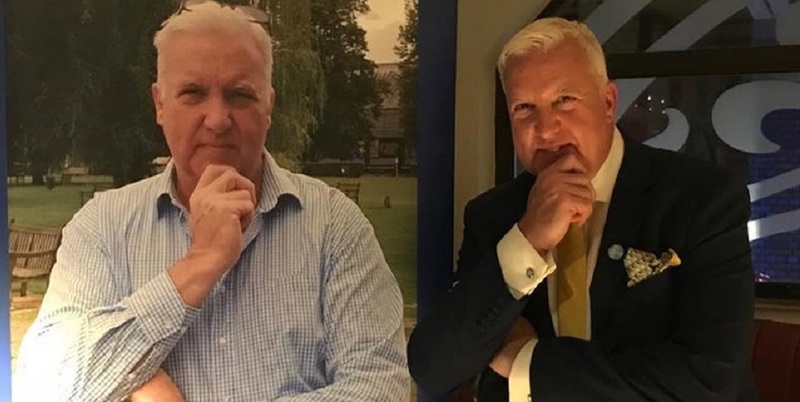 For many years the Hawkhurst branch of the Tunbridge Wells Conservative Association has organised an annual golf tournament, the prime mover being branch stalwart, Peter Dunlop. This year a challenge has been extended to the other Associations in the West Kent stable to make it a cross-constituency competition, date and venue to be confirmed. Both team captains have been identified; Peter Dunlop for TW and Allan Sullivan for T&M. There is however, one small problem. 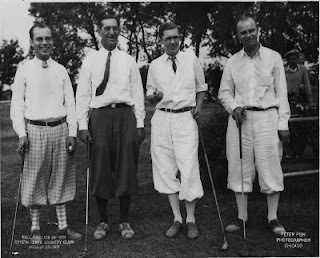 T&M have a handicap - they don't have enough players! Therefore - this is an appeal for talent. Or perhaps I should say this is an appeal for bodies (talent is optional). If you live within driving distance of West Kent and would like to boost T&Ms numbers, please get in touch! Either use the "contact me" box to the right of the page or leave your details via a comment and one of us will be in touch with the details. 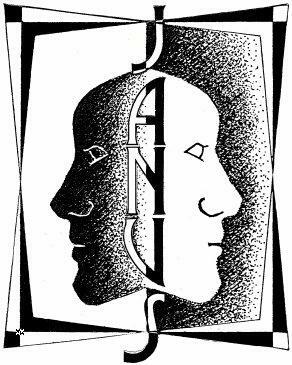 We have reached a tipping point in one of my Associations where the number of donors (ie, residents who respond to appeals, buy draw tickets or pay to attend social events) has exceeded the number of members. Having said that, Chatham & Aylesford (the smallest of the three Associations I work for) has had more donors than members for many years now. The money raised from donors, is just as valuable as membership, but I would like to find ways to involve these people more in our work and campaigning. Clearly they don't wish to join (they have been regularly asked and have declined the opportunity to do so! ), but as many contribute each year, they are clearly committed Conservatives. Without frightening them off, how do we involve them? With political membership in decline, all parties are fishing in shallower pools for their talent. Similarly, as membership dwindles so there is a real danger that the people who are interviewing and selecting the candidates represent a narrower world view. I would love to involve donors and registered supporters in the LG candidate selection process, but I cannot see a way to do so within the CCHQ Selection Guidelines (which I fully support). Perhaps in the future we might consider asking the branch committee (where they exist, or the Local Government Committee where they do not) to drawn up a shortlist of candidates and then allowing closed primaries (open to all paid-up members, donors and registered supporters) to hear and question the candidates and make the final selection? It's worth a thought. 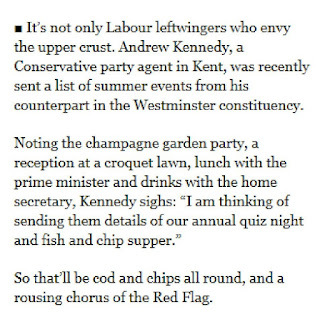 If CCHQ wish to try it out, I am happy to ask the Chairman to put it on the agenda for discussion here in West Kent. In the meantime, however, all three Associations have now signed-off an ambitious plan to reach out to the wider community in a bid to attract new candidates and, hopefully, councillors. All will be revealed on the official launch day - Friday 12 July. Watch this space! Time to pave over "Conservative Grassroots"
I am a Libertarian on social policy and have sympathies with Murray Rothbard on economics, so the organisation 'Conservative Grassroots' are anathema to me. I do, however, recognise that they represent a shade of opinion within the wonderful broad church that makes up the conservative coalition, and whilst I don't agree with them, they have every right to express their view and seek to persuade others to follow it. Therefore, when a senior member of Conservative Grassroots emailed one of the Associations I work for, asking for the name and contact details of the Association Chairman, I responded promptly and politely from my Blackberry. The lady replied, "Wow, that was efficient." To which I replied, "advantage of having an agent who works from home". Then, blow me down, she replied "more like you are claiming overtime". What an incredibly presumptuous and arrogant thing to write, especially as we had never met, she had no knowledge of me nor the Associations I work for, and I had just done her a favour by promptly dealing with her enquiry, when many might have hit the delete button. nor put in a claim for so much as a mile of travel, since I was appointed." "...and I support liberal immigration, equal marriage and for the past 11 years I have lived happily with my gay partner - who is an ordained Minister! And, for the record, I am as good a Conservative as you will ever be." I am currently doing a fair number of training and briefing days for groups of candidates, campaign managers and volunteers. This morning I was "singing for my supper" (or singing for my blueberry muffin) in Sutton, at an event for their 2014 Local Government candidates. I first got involved with the London Borough of Sutton when I was asked to support the Carshalton & Wallington Association during Boris Johnson's re-election campaign. We "adopted" Beddington North ward, and over six months I organised car loads of volunteers from West Kent and we canvassed the whole ward and delivered a few leaflets, too. I think it is fair to say that at that time moral was low. They had lost four consecutive General Elections, and having the London local election on the same day as the GE saw the Lib Dems regaining most of the seats the Conservatives had gained four years earlier. After the Boris campaign I had little further contact, other than exchanging emails with Neil Garrett (Deputy Chair Political), and offering help and advice when asked. Today I returned to speak at a joint meeting of the Sutton & Cheam and Carshalton & Wallington Local Government Candidates. The event was organised by Neil from Carshalton & Wallington, Paul Scully, who is Sutton & Cheam's excellent Parliamentary Candidate and his new Campaign Manager, Ranulph Murray. And, my goodness, how things have changed. My 45 minute session lasted almost two hours as activists and candidates made copious notes and peppered me with questions. I have never had so many intelligent, provoking, challenging questions, and it was a joy. There is little worse than an audience which looks blank and say nothing. There were lots of younger people in the room too, most of whom were candidates. Another sign of an open and vibrant association. It's very easy to spot a group who are going through the motions, there under duress as it's expected of them, and a group who are there to listen, learn, share ideas and swap best practice. This group was definitely the latter. After my presentation I stayed on to hear Paul Scully talking about a new canvassing technique they have developed, which sounds great - so we will try it in West Kent, too. Proving that no matter how long you've been in the business, you never stop learning and developing. I drove away from Sutton today inspired by the enthusiasm and commitment of those I met. They have a mountain to climb - Sutton Council has 45 Lib Dems, 11 Conservatives and 1 Labour councillor. However, many of those Lib Dems have majorities of 100 in seats with electorates of 8,000. They will do well. I will preface this post with the fact that the Conservative Party's Approved Candidates List contains hundreds of people of outstanding ability. Many of those who have appeared in Tonbridge & Malling to assist with recent elections will make great Members of Parliament. This is about the "local aspirants". Mainly those who have never been on the Parliamentary List, or once were and have since been removed, or perhaps applied and were not accepted. This does not stop them moving their families into constituencies with an ageing incumbent MP and awaiting their chance. 1.Phone local office and speak to Chairman / Secretary / Agent. Tell them how skilled / wonderful / successful you are and that you have just moved in and would like to join. Request membership details. 2. Return membership form immediately with ingratiating accompanying note. Phone up the following day to check it's arrived. Ask if Chairman / Secretary / Agent would like to meet for lunch. Agree lunch date - spend entire lunch talking about how skilled / wonderful / successful you are. 3. Join your well-meaning and hard-working local branch. Inveigle your way into the Chair on the basis that you are skilled / wonderful / successful. Serving members may look on suspiciously, but are so relieved that someone young and enthusiastic has turned-up, they swallow their suspicions. Get yourself elected to the Executive Council. 4. Immediately preside over the ruination of your local branch by not returning emails or calls, not calling a branch meeting or if a meeting is called, emailing on the night to apologise that you cannot come as an "unexpected crisis" has come up at work and has delayed you. Watch long-serving and dedicated committee members drift away. 5. Always reply to emails requesting campaign assistance to say how sorry you are, but due to *work pressures, *family illness, *childcare issues, *school visits, *train delays, *car problems, *charitable commitments (*delete as appropriate) you won't be able to make it that day. However, always add a note to say "keep me informed about future events" as this will at least convey the message that you are willing and might help in the future. 6. Always reply to emails requesting you attend fundraising events with a visiting Party Bigwig / Minister to confirm that, amazingly, your diary is totally free of *family illness, *childcare issues, *school visits, *train delays, *car problems, *charitable commitments (*delete as appropriate) and that you would love to come. Ask for a ticket to be reserved for you and that you will pay on the night. Ignore email saying pre-booking only. Ignore phone call saying you have not paid. Begrudgingly drop cheque through Association letterbox on the night before when the Agent tells you that without payment you cannot attend. 7. Use your sharp elbows and complete lack of shame to push to the front of the queue so you can be standing next to visiting Bigwig / Minister for the photographs. Monopolise said Bigwig / Minister with self important talk, detaining him or her from meeting and thanking the other volunteers who work far harder for the Party than you do. 8. Read Executive Council agenda in hope of seeing item on Parliamentary Selection. When it's not there send apologies due to *family illness, *childcare issues, *school visits, *train delays, *car problems, *charitable commitments (*delete as appropriate). 9. Attend Executive Council promptly when an item about the Parliamentary Selection appears on the agenda, but visibly shrink in stature when the Chairman announces that he has heard from the incumbent MP who has decided to seek the Executive Council's approval for another term of office. 10. Three days later email Chairman / Secretary / Agent and explain that due to you being so skilled / wonderful / successful that you are sure they will appreciate that certain things have to give in your busy life, and for the sake of family and career they you have regrettably decided to stand down from local politics. Wait three years, and start again at point 1 above. Over the last few weeks a number of Associations had phoned or emailed to ask if I could advise or assist with their Summer Draw. They had heard on the grapevine that one Association which had followed my plan had trebled its income and another had doubled it. I decide to put onto paper a simple step by step 'Best Practice' guide about what we do in West Kent. I am sure others do it differently and many might even do it better, but as always I am happy to try to help and it is quite flattering that people feel it is worth asking for my advice. It is even more gratifying that complete strangers feel they can contact me on the suggestion of others. The emails follow a theme. "I hope you don't mind me contacting you, but (x) said you might be able to help with .......". Or "you probably don't remember me, but I came to a training event you spoke at in (x) and I was hoping you might advise me about..." And increasingly, "We read your blog and was wondering if you could help us with..."
So last Saturday, having made a few notes and planned what I wanted to write, I produced the West Kent Guide to Running a Summer / Christmas Draw. Actually, I must place on record my thanks to my long-suffering partner, Steve, who typed it up whilst I paced up and down dictating. With sample letters and step by step guides, it ended-up being seven pages long! I loaded the document onto the hosting service Issuu and posted a link on this blog and also on Facebook and Twitter. Then it took off ! Within an hour I started receiving emails asking for pdf copies as some readers couldn't print it off from Issuu. An Association in Gloucestershire called to ask if I would address their Executive Council (I declined on grounds of time and distance). 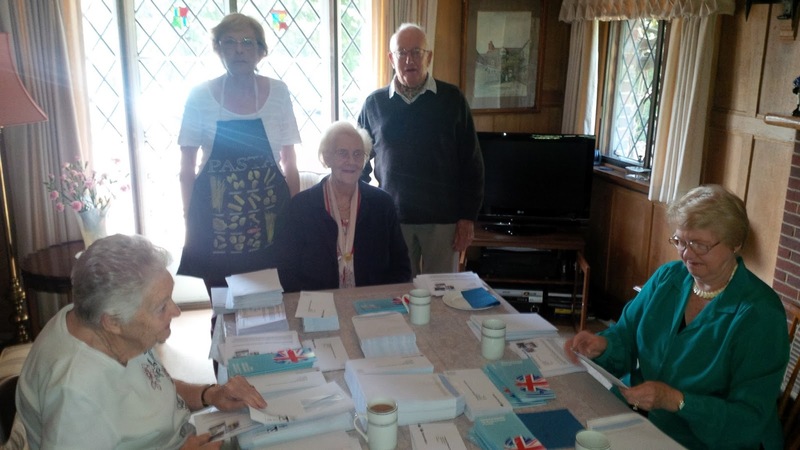 Two associations in the Midlands wrote they they felt sufficiently confident to start running the Christmas Draw again, having given up a few years ago when the sales didn't cover the postage. An Organising Secretary from Essex asked if she could come and spend a day with us to see what we do in West Kent, and another from Sussex asked if I could send pdf copies of our appeal letters and membership letters as they wanted to compare with what they did locally. A Chairman from a Conservative-held marginal constituency emailed to say "your blog has provided most of the items on our next Management Committee Agenda as I want to introduce your ideas locally", and I was then asked by a senior CCHQ staffer if I would spend some time supporting two of the newly appointed Campaign Managers from marginal seats as I am seen as such a positive influence and she felt my optimism and confidence would encourage them. 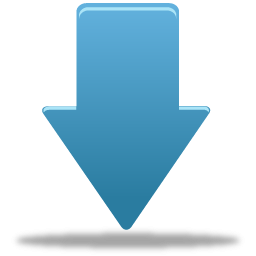 As of today, 1735 people have downloaded my Best Practice Summer/Christmas Draw Guide. I am sure there are a few people who might see a paid employee spending time of raffle tickets as being a waste of time and resource. I disagree. The money raised through the two national draws raise funds which are spent locally on campaigning. But more importantly, by increasing our base of donors, we extend the number of people who interact with us, who might donate to appeals, attend our social events, join the party and come out canvassing or delivering leaflets. For example, in Chatham & Aylesford, there are 22 new donors who bought summer draw tickets this year who have never supported us before. Another point that must be made is how hungry our volunteers are for information and support. We must never forget that the purpose of the Conservative Party and all its local Associations, is to win elections. However, building the local base, increasing the number of donors, bringing new people into the fold and turning those donors and supporters into active campaigners, is all part of the election winning process. If my little "how to run a raffle" guide has helped, even in some small way, then it was well worth doing. 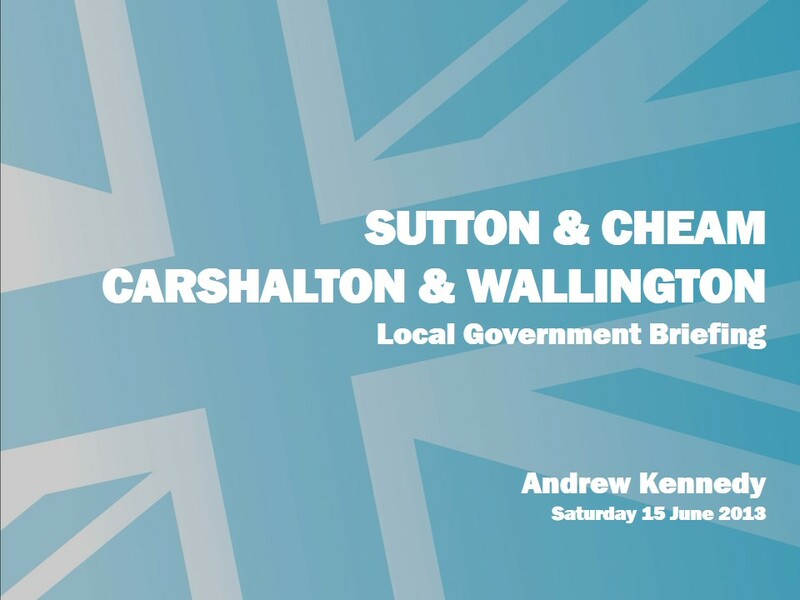 Tomorrow, I am off to Sutton and Carshalton to speak to their Local Government Candidates about how to beat the Lib Dems. West Kent adopted a ward in Carshalton for Boris Johnson's Campaign (Beddington) so it will be good to see some old friends again. Rummaging in the attic at West Kent HQ we came across an old edition of a magazine called "The Conservative Agents' Journal" Spring 1990 edition. Apart from listing the names of 300+ agents, it was reassuring to see how little has changed. First, a letter from my predecessor in Tonbridge & Malling, Anne Moloney (now a local councillor) complaining about the Treasurer's Department trying to "steal" our information and take money from Associations for wasteful projects at 32 Smith Square. 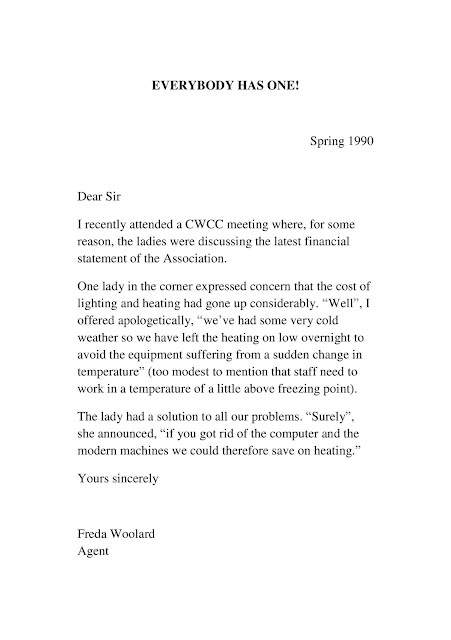 And this was followed by a letter from another long retired Agent recounting a bruising conversation with a member of her Conservative Women's Constituency Committee (CWCC). I suspect if there are any of us left in 2036 we will be complaining about the same things all over again! at the launch of Chris Woodward's Motorbike Raffle, to raise money for the local Community Centre. Tunbridge Wells Councillor Chris Woodward (above) has just launched a super idea to raise funds for the local Community Centre in Broadwater, the ward he represents on the Borough Council. Chris is raffling his first edition Honda touring motorcycle, which he has owned since new and has just 35,000 miles on the clock. It has a retail value of around £2,500. Tunbridge Wells Conservatives are sponsoring the raffle by covering the cost of printing the raffle tickets and all the additional related printing, postage and promotional costs; as a result, every penny raised through ticket sales will go to the charity. Each household in the ward will receive a letter from Chris explaining the raffle and inviting them to purchase tickets. See HERE. Chris will also be selling tickets to Council colleagues and local Conservative members, as well as through local shops and businesses. If you would like a few books of tickets, please call the Tunbridge Wells Conservative Association Office on 01892 522581 and we will pop them in the post to you. The draw will be made on Monday 26 August 2013. If the winner does not want a motorcycle there is the option to have it auctioned on Ebay and take the money raised instead (less 10% commission for the Community Centre). Two weeks ago I blogged about how Tonbridge councillor Tom Edmondston-Low was supporting local shops with his Shop Local Campaign. Now we have this good work from Chris Woodward. At a time when voters are cynical about politicians and glibly say "you're all the same" I am delighted to be able to highlight just two (of many) examples of local councillors who are really making a difference. Well done Chris and to all our local councillors (of all parties) who work hard for their communities. 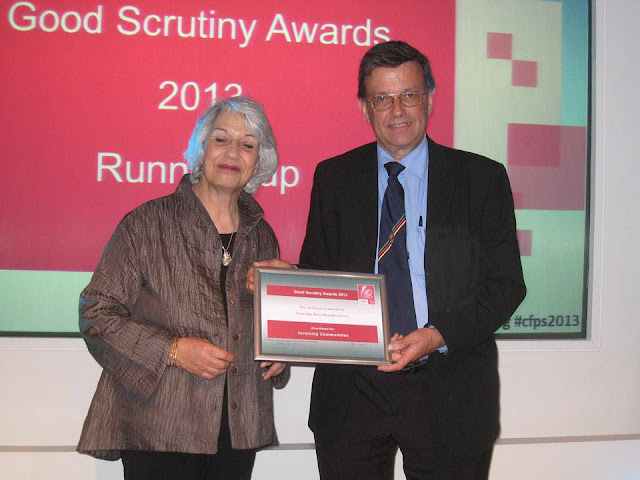 Congratulations to my friend and colleague, Cllr David Elliott, who travelled to London yesterday to receive a "Good Scrutiny Award" from Baroness Hamwee in recognition of Tunbridge Wells Borough Council's outstanding work on dog fouling. That's another one 'in the bag' ! "The amount of excrement along Camden Road is a disgrace. I don't know whether to blame the dogs or their owners." Medway councillor Andy Stamp was two-times Liberal Democrat Parliamentary candidate for Gillingham & Rainham and Deputy Lib-Dem Group Leader. 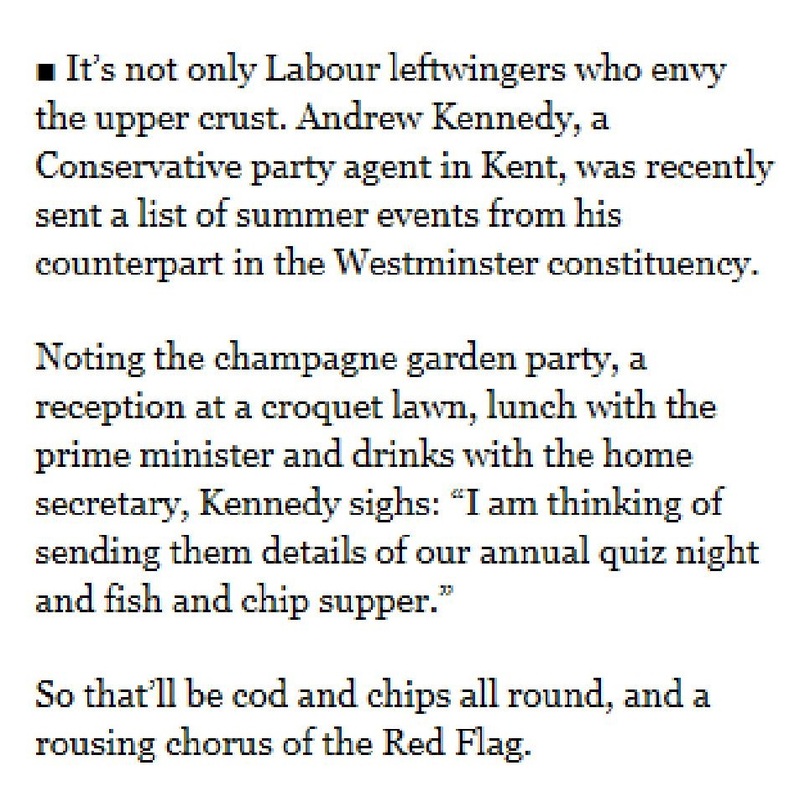 That was until a row over who said what to whom at the annual Mung-Bean & Shloer Lib-Dem fundraising supper led to a falling-out with his former colleagues. In 2011 he stood and was elected as an independent, but along was his fellow independent councillor has now joined Labour. Given Medway Labour Party's truly outstanding ability to lose almost every election it fights, many might consider this a rare case of a rat joining a sunken ship. However, I wish Cllr Stamp and his colleague Cllr Cooper every happiness in their new political home. Before the Comrades get too excited however, they should consider some of Cllr Stamp's comments about them on his Twitter account. Apparently, until his "road to Damascus" style conversion, he considered his new colleagues to be "liars", of "scraping the barrel", capable of "dirty tricks", of "leaving a trail of destruction", of having "opinions on subjects they knew nothing about", and he called them "desperate" and "clueless". And they were the nice things! Despite our political differences, I have a lot of time and respect for Medway Labour Leader, Vince Maple. I wish him well with his new convert. I just hope Vince remembers that "an enemy of my enemy is seldom my friend." 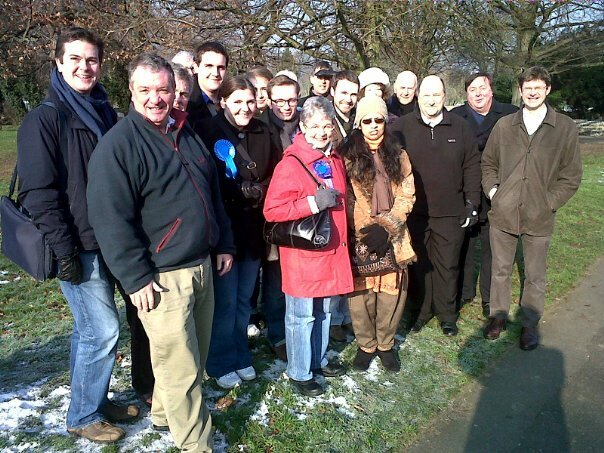 @tristanosborne Congratulations on losing your 3 MP's , The people of Medway gave you a clear message . @tristanosborne Think you have enough squabbles within your group ,Labour left a trail of destruction in L&W ! Short memories ! @tristanosborne Yet again lots of lies, half truths and smears from a desperate Labour Hack. @cllrtrisosborne @medwaymessenger As per usual you are totally clueless! Residents on housing list in Medway deserves better ! If you write to 18,000 people inviting them to join the Conservative Party, you are bound to upset a few of them ! Well, that's what we found out today when 18,000 residents received a letter from our Chairman asking them to send us £25.00. Even if just 1% are stirred to complain - that's 180 contacts (or 25 per hour). Fortunately it wasn't even 1% - but we have been quite busy! First are the unavoidable but no less distressing calls; people phoning to tell you their husbands, wives or relations have died. These are inevitable - even the most diligent organisation which scours the local press and records every death notice will fail to note every passing. No group which relies on public goodwill would ever deliberately write to someone who has died, and I deeply regret the distress such contacts inadvertently cause. The next group are the indignant. How did you get me name and address? Why did you write to me ? Take me off your list immediately! I have no objection to these calls, though why some have to be so downright obnoxious is a mystery. Again, we have no wish to write to people who don't want to hear from us, so we will gladly update our records for the benefit of both parties! I also understand why some people have data protection concerns and want to know how we obtained their name and address. Sadly many cannot accept that registered political parties are legally allowed to use the electoral register for campaigning and membership purposes. I recall one lady demanding we never contact her again - even requesting a signed letter confirming that we had removed her from our mailing list. I was therefore somewhat amused when the same lady wrote an equally obnoxious letter just before the election to complain that her neighbours had received a postal vote letter and she hadn't. And then we have the angry brigade! They come in various shades or purple, but have common traits; they all seem to read the Daily Mail and are fond of either quoting Richard Littlejohn or sending cuttings, with various words and phrases neatly underlined. And just in case you thought these things were apocryphal, many do use green (or red) ink and write "and another thing....." They also write on the reverse of the letter you have sent them, and if they run out of space (which is almost inevitable given how much they need to get off their chests) they continue around the edges and in the margins - and even enclose other scraps of second hand paper with postscripts. 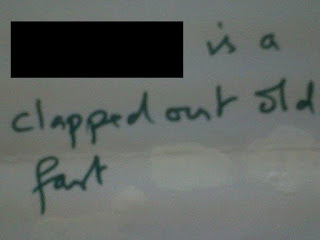 We had one chap today who phoned to tell me what he thought of us. Our answering machine will record for 60 seconds before cutting out. He called five times using his full minute each time. Had he not used the first 40 seconds of each call recapping what he said on the previous one, he might have got through it faster. The most amusing aspect was when he then called a sixth time and shouted, "and if you had bought a British answering machine instead of this foreign crap it wouldn't keep cutting out on me. Goodbye." "(name of councillor) is a clapped out old fart"
What was most amusing, however, was the writer, having painstakingly removed the address from the top of the card, signed it! Then, realising what he had done, 'tippexed' out the signature leaving it still legible if held up to the light. The postcard (along with various other contributions) takes pride of place on my office noticeboard! How the other half really live ! Amused (and ever so slightly envious) to receive a mailing from Westminster Conservatives listing their Summer Programme of Events. £5.00 surcharge if you don't pre-book ! (Another £5 extra if you pay on the night). I am thinking of sending them details of our annual Quiz Night and Fish & Chip Supper - tickets just £10 and no surcharge if you pay on the night! I have received several requests from regular readers, particularly those from Associations run by volunteers, to explain how we run our Summer and Christmas Draws and make so much money. This coinsides with my role on the Kent Area Management Committee, where I have responsibility for sharing Best Practice. Across Kent we have some incredibly talented people, and our 17 Associations all have their own strengths and weaknesses. We are often quick to criticise those who don't appear to pull their weight, but sadly we are not so fast to acknowledge and share success. This is something I am passionate about and keen to address. Take the annual Summer and Christmas Draws. Not perhaps the most vital or exciting aspect of a political party's work, but given the profit from this will finance campaigning, we need to get it right. For example, last year one Kent Association raised £5,000 from the two draws where the neighbouring Association (with the same number of members) raised just £2,500. (I am not betraying any secrets - this information is all published on the Electoral Commission's website). A quick "back of the envelope" calculation shows that if each of our 17 Associations performed as strongly as the strongest (in %age response terms) we would generate around £25,000pa of additional income - the money required to cover three parliamentary election campaigns! This year the newly elected Chairman of one Association asked me to review their own operation and advise how they might improve their income from the summer and Christmas draw. In fairness, I should acknowledge that this particular Association has one of the strongest branch networks in the county and raises more money from branch fundraising than anywhere else. However, their direct mail income was weak and last year their summer draw returned around £350. By following the Best Practice plan, their 2013 summer draw income has more than trebled to £1200 (with just £70 of additional costs). For anyone interested, here is a copy of my plan which can be downloaded via the following link. I hope you find it helpful. Feel free to contact me if you would like further information. Bon Voyage and Bonne Chance ! 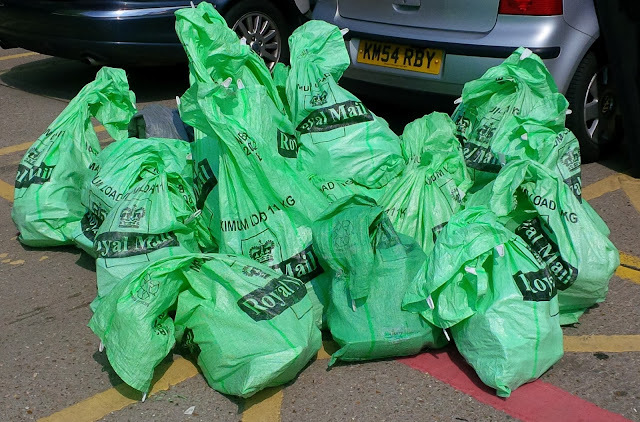 18,000 invitations to join the Tonbridge & Malling Conservative Association, and participate in the parliamentary selection contest, have just been dropped at the local Royal Mail Sorting Office and should hit the voter's doormats tomorrow. Our largest ever membership campaign. The plan was signed-off at the Management Meeting just one week ago, and we have had them printed, personalised, folded and packed in five working days! Fingers crossed for a reasonable return. We don't expect it to cover its costs in year one, but if it can bring in 50-100 new members, who in turn will help revitalise the Association and introduce new ideas and fresh thinking, it will have been worth every penny. A big thank you to members of the Chatham & Aylesford Association, the best envelope packing team in the UK. Working in shifts, they packed and bundled 18,000 membership recruitment letters in just one and a half days. This, however, is far from their record. 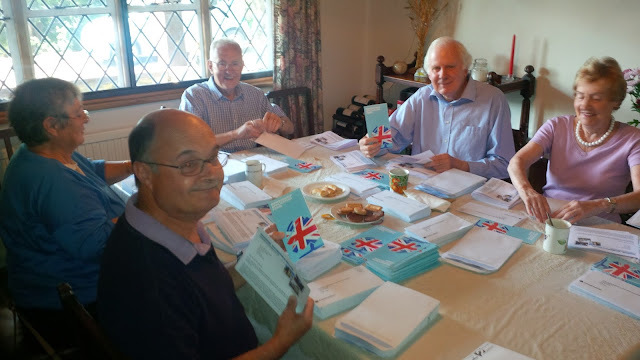 Just before the 2010 General Election, working in tandem with Tonbridge & Malling, they mustered a team of 110 volunteers and packed 70,000 envelopes in a day! Thank you to all who came to help at very short notice, in particular And special thanks to Charles and Joyce Gadd, who open their home time and time again, provide refreshments for the volunteers and store all the supplies. Another example of the army of volunteers without whose support and dedication the Party would cease to function. Thanks also to Adrian and Pat Gulvin, John Balcombe, Peter Homewood and Janet Sergison, who came earlier in the day and were not there when I took the photographs. So what did you do at the office today, dear...? Schedules, selections and success in Sussex! 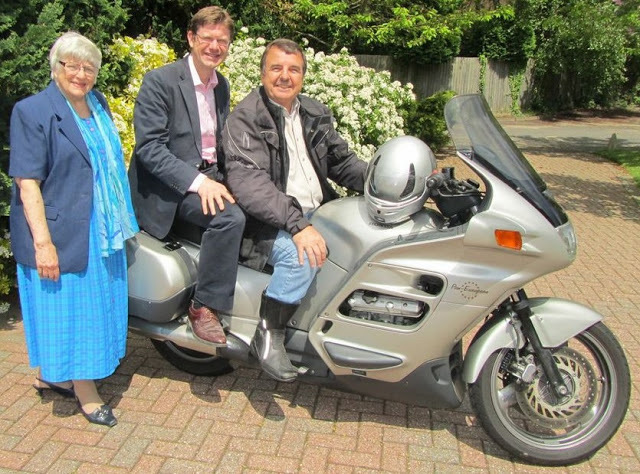 Cllr Woodward has the Va Va Vroom !